Fiscal Year 2019 began on October 1st. For Tim Dillon, Executive Director at the Kenai Peninsula Economic Development District, that means a tour, of sorts, around the area, sharing year end financials with city councils and other groups. You know how we all mumble a bit beneath our breath when we see road work ahead and a flagger stopping a long line of cars during road construction season - especially when we’re at the back of the line? Frustrating, yes, and this year it seems to be happening everywhere you turn in the Central Kenai Peninsula. But being glass-half-full kind of people here at public radio, we’re looking for the positive spin, of which there are a surprising number. The most surprising number is: $109 million, which is what’s being spent on state roads in the Central Peninsula. It’s been nearly 30 years since the oil tanker Exxon Valdez ran aground in Prince William Sound, and mitigation projects that sprang up as a result of the spill are still going on around the state and here on the peninsula. Biking of all stripes is growing in popularity on the Kenai Peninsula. To be fair, it’s happening it lots of other places, too. On the Peninsula, countless volunteer hours have been spent building and maintaining local trails, but infrastructure investment for bike and other multi-use paths is happening, too. The state’s biggest economic engine, for good or ill, remains oil and gas. The governor was in town earlier in the week for a rural development forum in Soldotna and we got some face time with him at the Soldotna library. We started off with AK LNG and how that project is coming amid China’s trade disputes with the Trump administration, and we’ll also touch on how rising oil prices are affecting the budget conversation in Juneau. The city of Soldotna has looked at expanding its footprint at various times over the years. The most recent effort goes back almost two years and has potential economic implications for residents, businesses and the city. Here on the Kenai Peninsula we take our sportsfishing seriously. People fly or drive thousands of miles for the opportunity to wet a line in our cold, fish-filled rivers, streams and inlet. Helping visitors do that is a full time job for thousands in a score of industries, and today on Econ 919, we talk with Jim Voss, the developer of a new smartphone app, Alaska Fishtopia, that is designed to take sportsfishing as seriously as the angler who uses it. The 2018 salmon season is getting off to a very slow start, with restrictions and closures around the state. King fishing on the Kenai has been dialed back to catch and release and for sport guides, that’s nothing new. This week, temporary lodging. With nearly 4 million listings world wide, AirBnB has dramatically changed how people travel. They actually list more rooms to rent than the top five hotel chains combined. But it’s not just the big hotel companies that are having to deal with online, short-term rental bookings. Small and local is still the flavor for the majority of businesses around the Peninsula, but as many of their owners would tell you, getting those ventures off the ground is anything but a straightforward process. At the heart of the debate about the borough’s budget is the borough’s land trust fund. It’s got $7.5 million in it right now, but that money isn’t doing much, and there’s not a solid plan for what could be done with it. Nonprofit organizations permeate the Central Kenai Peninsula, doing such disparate public services as feeding the poor, protecting the vulnerable, attracting visitors and broadcasting unbiased news and information from around the state, nation and world. The one thing they all have in common is the need to raise money for their missions. On this week's Econ 919 we find out what professional fundraisers would like you to know about funding nonprofits. Well breakup hit the Kenai with a vengeance in the past week, with icy roads seemingly disappearing overnight and the rivers opening up to accept this year’s runs of salmon. All the salmon except those that go to support Peninsula fishing families that is - most of those wind up processed and shipped to markets nationwide. And it’s the jobs inside those seafood processing plants — very few are actually canneries any more — that we look at on this week’s Econ 91-9 feature. This week, the Pebble Mine and what it might mean for the Kenai. Hello, it’s March 30th, 2018, and I’m Jay Barrett with KDLL’s Econ 91-9. The Alaska Job Service Center held its annual Job and Career Fair last week in the Soldotna Sports Complex. 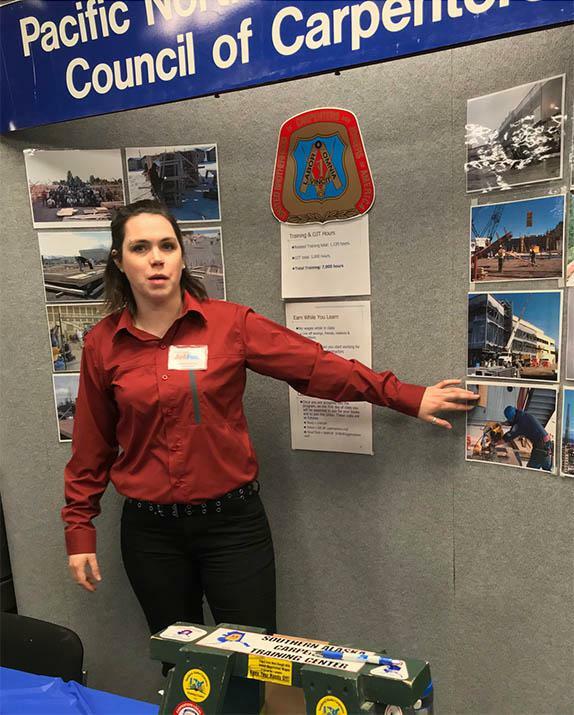 A score of job and military recruiters, trainers and more were on hand, as were hundreds of Central Peninsula folks looking for a job or a new career. When it gets closer to fishing season, we’ll tell you what local canneries have to offer, but today, we focus on training. As politicians continue the war over who should and should not be entitled to health care in America, people continue to fall ill, many with little or inadequate insurance. Despite Obamacare, many still live without. On this week's Econ 91-9, Jay Barrett shares a profile of the Kenai Peninsula Community Health Services, which offers a wide range of services while it has grown exponentially and contributed millions of dollars to the economy over the years. This week, what the alaska gasline development corporation needs from the city of Kenai for it’s much-hyped LNG project on the North road, but we start with job training.